Forest School (FS) is an educational approach that has existed worldwide since the late 1950s, with thousands of programs throughout the world, starting in Denmark and Sweden, moving through Scandinavia to Europe, China, Australia, New Zealand and now Canada, with over ten thousand Forest School programs in the UK alone. In FS, children spend anywhere from a half day to a full day outdoors in various urban and near-urban parks, natural spaces adjacent to or on school grounds, or natural playgrounds and outdoor classrooms. Children attending FS have the opportunity to learn in a natural environment on a regular basis, ranging anywhere from a half to a full day. For instance, some programs are offered to students half a day per week, whereas other schools and early years centers have embraced this approach on a more full time basis, resulting in students spending the majority of their days outdoors. Forest School Canada was formed in the spring of 2012 as an education initiative of the Child and Nature Alliance of Canada and by 2014 became an independent not-for-profit organization working within a collaborative leadership model. 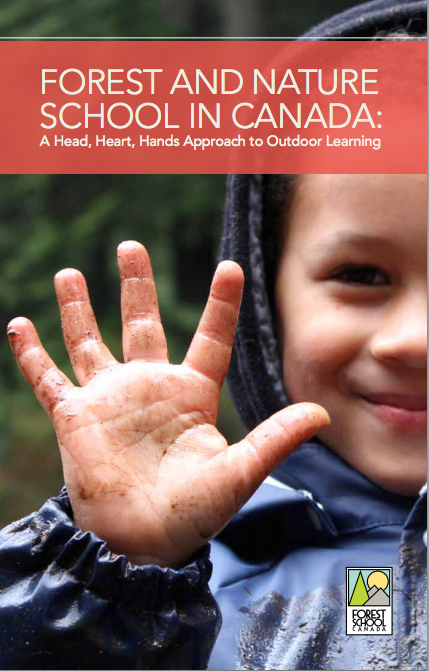 In June 2014, they published a guide to Forest School to assist educators and communities considering the establishment of a Forest School. FS is both a pedagogical approach as well as a program of delivery. Although it has many different names, there are two main features that separate it from other outdoor and environmental education programs. All FS programs adhere to: regular and repeated access to a natural space, as well as child-directed, emergent and inquiry-based learning. The defining feature of this type of nature-based education program is that children are provided with opportunities to build an on-going relationship with the land, to a dedicated educator, to one another, and to themselves through this educational lens. The activities that happen in FS also vary, depending on the season, climate, landscape, animals that have visited the night before, trees that have blown down in the wind, the kinds of provocations elicited by the educator, various tools and loose parts for building and creating, the children who are in attendance, how long the group has been formed, and most importantly, what interests the child. Sometimes children will work independently, while at other times they will work collaboratively to create something, problem solve, or support one another. Little Nest Forest Preschool, on Bowen Island, is in the development phase and plans to offer a program based on a blend of Reggio Emilia and play-based philosophy. The aim is to offer an entirely-outdoor all-weather school. Fresh Air Learning runs a variety of programs in the Metro Vancouver area for preschool and elementary-aged children. In Vancouver their programs for preschool-aged children are based at Pacific Spirit Park and at Southlands Farm, and include a range of weekly one-day and two-day programs that run from September to June. In North Vancouver, they run programs for preschool-aged children based in Lynn Canyon Park and at Maplewood Farm. The Victoria Nature School began as Victoria’s first forest school in September 2013 and offers a 3-5 year old preschool program, teacher training workshops, and custom-designed school-aged programs. Nature School, Sunshine Coast School District 46, NEST, is located at Davis Bay Elementary School, where 38 students from Kindergarten to Grade 4 are enrolled with a staff of two teachers and one educational assistant. They access learning in the forest and also at the beach or the estuary close to their home base.